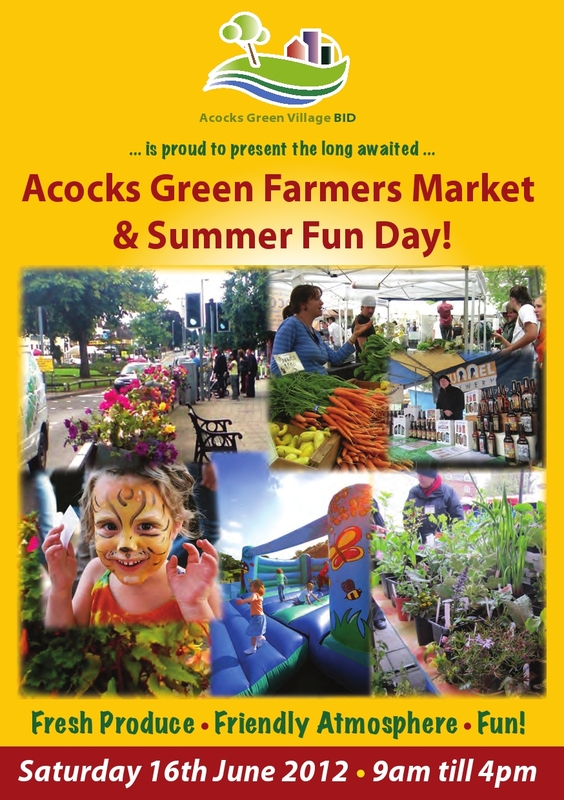 Acocks Green village will be the place to be on Saturday 16th June when the Farmer’s Market comes to town. As well as activities for kids and stalls loaded with tempting fresh products,we are honoured to have King Pleasure and The Biscuit Boys entertaining the shoppers: ‘the finest, most authentic Rhythm & Blues band ever to come from outside the USA’. Thanks go to the Business Improvement District (BID) Manager, Sandy Gianni, who has made this day happen. 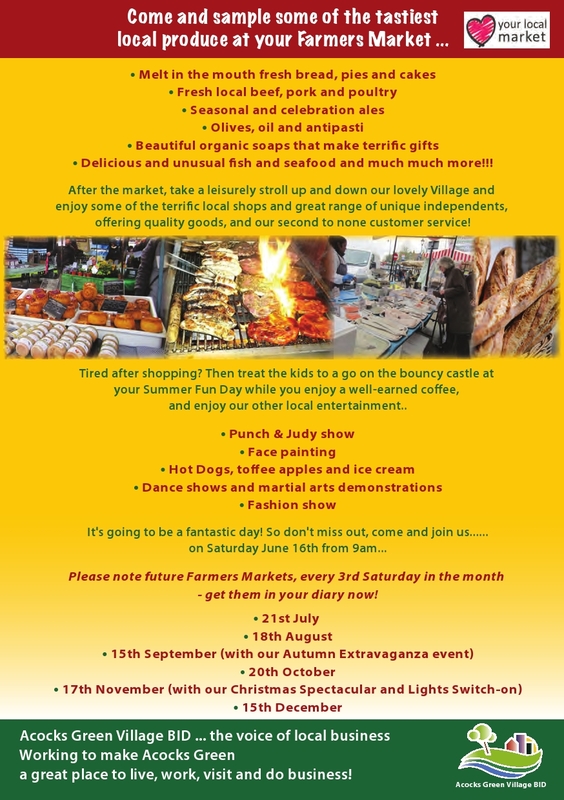 The Farmers Market will be a regular monthly event, so mark it on your calendar and make sure your friends and family know about the exciting developments going on in our village. This entry was posted in Events and tagged Acocks Green, BID, face painting, Farmers Market, Fun Day, King Pleasure and the Biscuit Boys, martial arts, Sandy Gianni, stalls. Bookmark the permalink. Excuse my knowledge of Acocks Green area, we do not know it that well.. Can you please write the address/location of the Farmer’s Market. The Farmers Market stalls will be on the service road outside opposite Holy Souls Church, around the Nat West Bank, Scope etc. Fun Day activities will be further down the village on the wide pavement by Costa Coffee etc. Hopefully you won’t be able to miss the activity if you wander down the village on Saturday. Fingers crossed for improved weather! Lovely to see some diversity brought into Acocks Green. I love farmers markets and it helps in the fight between local shop-owners and the big supermarkets. Hello Marie, Thanks for your positive response. Lets hope the Farmers Markets are well supported and successful. They do make a refreshing change from the big supermarkets that dominate the retail world! This is in relation to the Community Day on June 16th. I assume it is too late for this year but please do keep us in mind for future events.